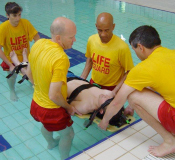 Pulse Training & Development is a leading training provider of QCF First Aid, National Pool Lifeguard Qualifications and Teaching Aquatic courses. We offer a range of first aid and pool related courses to some of the leading providers in the leisure industry, further education and as well as some famous names in the high street retailing. We pride ourselves in delivering high quality training solutions that meet the needs of our clients. All of our courses are delivered in a relaxed and enjoyable atmosphere with exceptional tutors who are fully qualified and have the relevant training experience in the latest protocols, procedures and legal requirements within the industry. 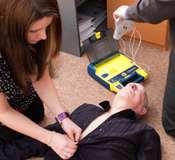 Our First Aid courses are recognised by the HSE, Ofqual and the QCF. Whether you're looking for a basic First Aid course or a more advanced course. We offer onsite cost effective training as well as an individual spaces. With a team of tutors who have been delivering the National Pool Lifeguard Qualification (NPLQ) across the county, with a wealth of experience spanning over 30 years. The NPLQ is the most widely recognised lifeguard qualification in the UK & Ireland and is a recruitment requirement within the leisure industry. 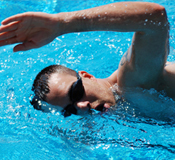 Our Tutors are some of the most experienced tutors in the county delivering Approved Swim Engand Qualifications. These courses are the industries standard of qualification and are essential if you are looking to become a swimming teacher. These courses introduce students to the hazards of manual handling, the risks involved and controls available in the workplace and what to expect from a manual handling assessment. "A really thorough course - a really good tutor who took the time explain things and used lots of great ways to demonstrate things that I have never learnt before. An excellent tutor, would recommend"
"I was feeling a little apprehensive as I always felt First Aid Training was beyond me, however the instructor made me feel at ease and explained everything in an easy to follow way. I would recommend it to anyone"
"Great way to learn a serious subect. Darren made it fun interactive. Great Instructor"
"Fantastic Lifeguarding course, great fun would recommend Darren to anyone, have now started working as a Lifeguard at my local pool"